Are All Channels Equally Effective for Advertising? If you answered TV or digital, to the question above, you would be wrong. In fact, if you chose any singular medium you would be incorrect. Truth is, all mediums deliver a strong ROI on your advertising investment depending on the specific needs of a campaign and the brilliance of the creative material. To learn more about the benefits of different types of media, see our Integrated Marketing Across All Media resources page. But if you chose TV or Free-Standing Inserts, you’d be partially right. 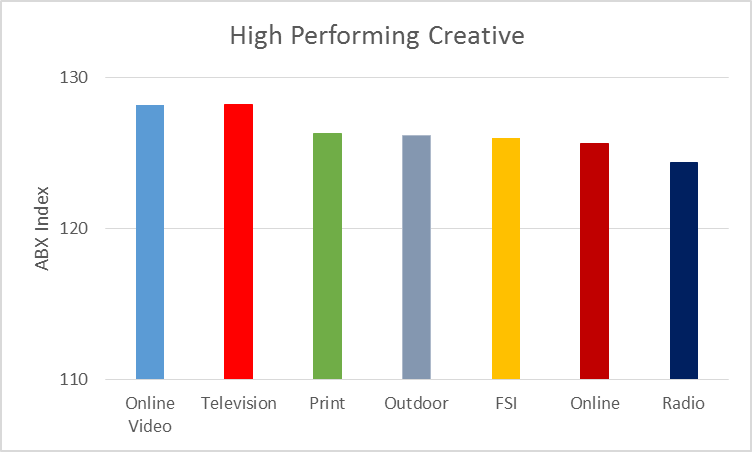 Average scores of all ads by media types (below) would suggest that Free-Standing-Inserts (FSIs) and Television are the most 'effective' mediums, with Online and Radio being the least. But looking at Average scores only measures the success of the creative, not the mediums. To determine which medium is best, we have to eliminate the creative factor. 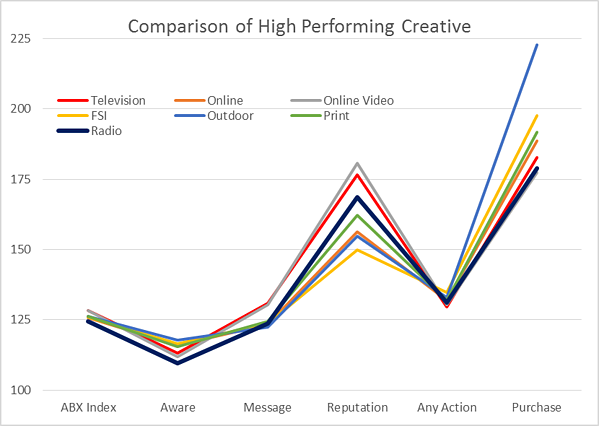 If we look at only a subset of successful ads for each media type with ABX advertising effectiveness Index scores of +20% above average or higher, (pictured below), each media type performs in a nearly identical fashion. In other words, all mediums are equally capable of producing high-scoring, effective ads. Another way to look at this is to tease out some of the major Key Performance Indicators behind each ad (Awareness, Message, Reputation, Any Action and Purchase). 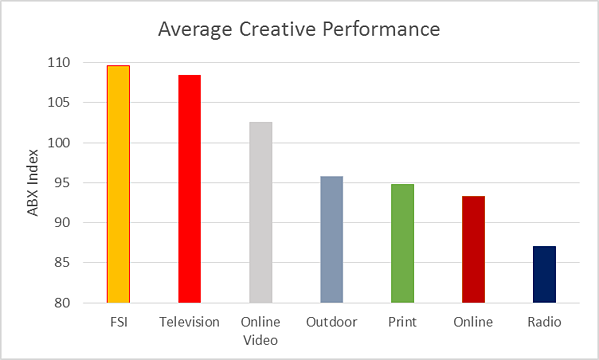 The chart below compares the high-performing creative from each medium to see where differences may lie. Amazingly, they show similar patterns for Awareness, Messaging and Any Action. Online Video, TV and Radio score best in Reputation, but Outdoor has the biggest impact on Purchase! So, with the right creative, every medium can be highly effective. Radio, with its low production and media costs, may offer the greatest opportunity, if your creative team can generate quality creative. Integrated advertising campaigns obviously perform best, utilizing each media type to its best advantage. As we evaluate tens of thousands of ads each year across every media type, we see highly effective ads and way too many under-performing ads regardless of medium. There is no longer the excuse of cost or inadequate time to avoid making every ad count. Today we can copy test any ad in 24 hours at a cost so low that it makes no sense to risk your brand reputation, not to mention your career, by putting out under-performing ads.